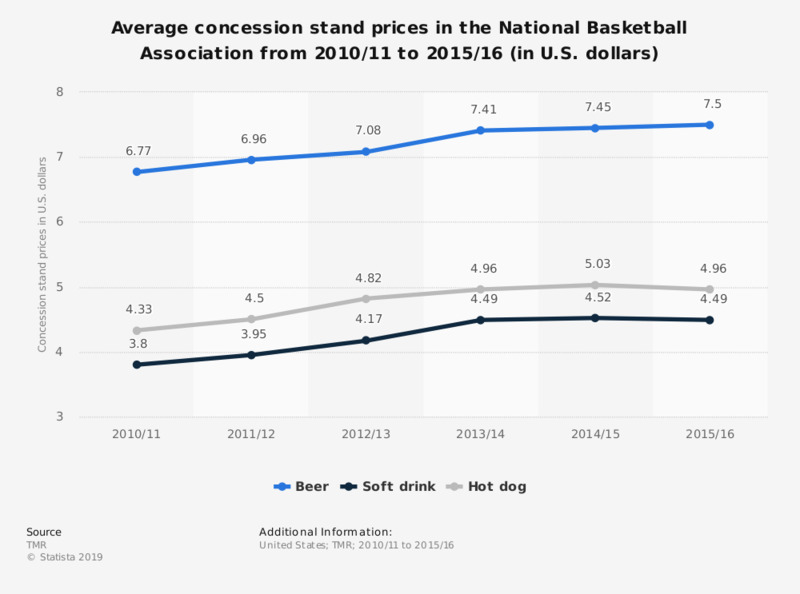 The statistic depicts the average price of soft drinks, beers and hot dogs in the National Basketball Association from the 2010/11 season to the 2015/16 season. The average price of a hot dog was 4.33 U.S. dollars in the 2010/11 season. The experience to watch a NBA game live usually costs more than just the price of the ticket. Spectators tend to purchase food and beverages during the game, pay for parking or spend money on the team’s merchandise, for example. In spring 2015, over nine million people stated that they bought clothing with NBA logos teams within the last 12 months in the U.S. During the game, concession stands sell beer, soft drinks, hot dogs and other items. For the last two seasons, the price of these items sold at the NBA concession stand has never been so high. During the 2015/16 season, NBA spectators paid, on average, 4.96 U.S. dollars for a hot dog, 4.49 U.S. dollars for a soft drink and 7.5 U.S. dollars for a beer. In the 2010/11 season, spectators paid an average of 4.33 U.S. dollars for a hot dog, 3.8 U.S. dollars for a soft drink and 6.77 U.S. dollars for a beer. The Fan Cost Index, which thrives to calculate the cost for taking a family to a NBA game, helps to put these figures in perspective. In the 2015/16 season, a family (2 adults, 2 children) was expected to spend about 676 U.S. dollars to have a live experience at a New York Knicks game. This the highest Fan Cost Index in the league, mainly because of the New York Knicks’ ticket prices. The Knicks have the most expensive tickets in the NBA, as spectators pay about 130 U.S. dollars on average for a ticket. In comparison, the average NBA ticket price for the 2015/16 season was 55.88 U.S. dollars. The Charlotte Hornets have the most affordable prices for families. A family is projected to spend about 212.4 U.S. dollars to have a live experience at their games. Again, the price of the ticket has an impact on the Fan Cost Index, considering Charlotte Hornets’ tickets cost an average of 30.2 U.S. dollars, and are the second least expensive in the NBA. Statistics on "National Basketball Association"
How interested in general are you in following professional basketball?